I have been lucky enough to see them twice this year and actually met Hessu Max, their Tommy Lee, before their gig in Dantes. Truly fantastic – I hope they make is large in 2011. 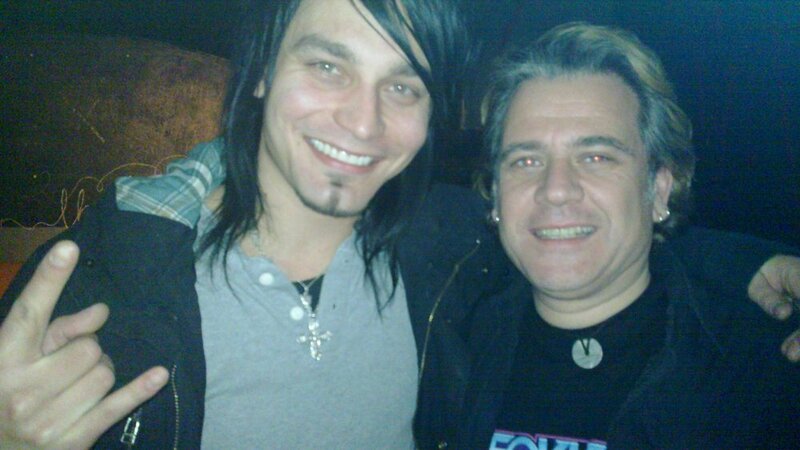 Picture above with Hessu Max from Reckless Love. Sonisphere this year was quite an eye-opener. The line up was pretty good and it was brilliant seeing Anthrax again after all these years. Other highlights included The 69 Eyes and The Cult (though Ian Astbury was somewhat condescending to the audience). Things went pear shaped though when a freak storm hit the festival. It wrecked the second stage and there were injuries and a fatality. However the audience remained and the show went on after quite a break with Iggy Pop doing an acoustic set. He is not my favorite artist but the performance was mesmerizing. This, and Alice Cooper’s brilliant performance made up for the disappointment of Motley Crue having to cancel as their gear was wrecked. Alice’s band played with Slayer’s kit and it sounded like it … really heavy. On the album front, I have been listening to lots of different stuff on Spotify. Luckily I scrobble so you can see how the last year went as jabba_29 on Last FM. Linkin Park dominate the airwaves in my household, but an honorable mention should go to Porcupine Tree. I was lucky enough to see them in 2009 and have have grown into them even more. Brilliant. A Thousand Suns (Linkin Park) is strangely compelling. I was really unsure about it, but there are some tremendous songs. Waiting for the end and Blackout are the standout tracks for me, but listening to the album on the whole it is a great to listen to in order. That’s it for now. I wonder who will dominate 2011? What do you think?